On paths or roads, enjoy the diversity of the Côte d’Azur, at your own speed. A route and a schedule to suit everyone’s taste. The mission of the bicycle tourism plan is to develop tourism in the Medium and High Mountain areas in Alpes-Maritimes by putting in place a new tourist attraction, including specialized events, in the framework of a triennial action programme (2011-2013). 37 operations are envisaged in this Plan, ranging from the development of cycling circuits and routes, to the design, promotion and marketing of very high quality tourist products. These propositions have been planned with all types of cyclists in mind - families, tourists and sportsmen and women. They meet precise criteria for height difference, distance and difficulty. By the end of 2012, the cycling circuits are expected to include accommodation and catering facilities, services for cyclists, tourist attractions, sites of cultural and natural interest and activities to be found along the itineraries and nearby. We can suggest a series of itineraries in the medium and high mountain area suitable for different types of cyclists. Click on the type of cycling you have chosen. Cycling is a simple activity. 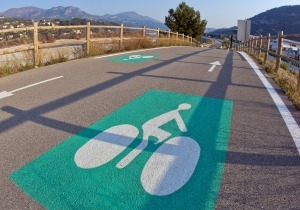 However, before setting off on any cycle ride, one should follow certain rules and take precautions, in particular, ensuring you set off with suitable equipment.